But behind the cruelty, there is an equally cruel truth: few, very very few, precocious performers continue to grow, exponentially, into fully fledged geniuses – remarkable humans whose art and spiritual humanity continue in an unbroken arc of brilliance until their later life. Yehudi Menuhin and Stevie Wonder, almost definitely; Nigel Kennedy and Michael Jackson, maybe not. For all the right reasons, Wolfgang Amadeus Mozart is held up as the child genius whose creative arc was perfect into adulthood. From his first compositions at the age of five (think about it) to his death at only thirty-five in 1791, Mozart composed over 600 works – pushing the art of music forward indelibly, each work building on the discoveries, flashes and insights of the previous. 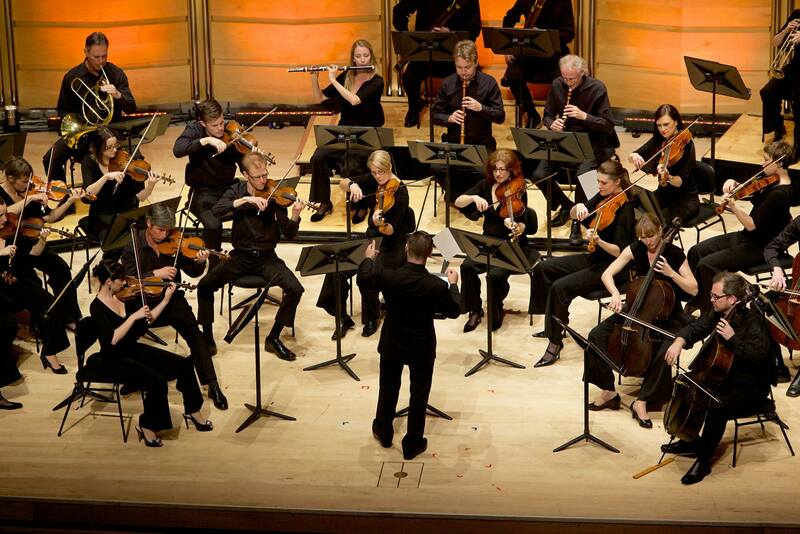 The Australian Brandenburg Orchestra, under leader Paul Dyer, have built their Concert Series 4 for 2014 around Mozart’s last symphony, his 41st – The ‘Jupiter’. But, as ever, Dyer has balanced perfectly it with two contrasting and stunning works from different times in Mozart’s life. The Overture to the opera ‘Lucio Silla’ was written in 1772, when he was only 16. The ‘Concerto for Flute and Harp’ from 1778, was composed six years later in Paris, during a time Mozart chafed against the social and creative constrictions to his art. The Overture immediately put me into that warm place that The Brandenburg conjures effortlessly. This human-scale music, played on period instruments, with all their attendant pearly and woody tones, lights a glow in the heart and in the soul that few other ensembles, or musical experiences can. Led through its three short movements by Dyer at the forte-piano, the ensemble sparkled, glowed and danced with the music, now heatedly, now slowly. Mozart’s ‘Concerto for Flute and Harp’ – originally written for the Comte de Guines, an accomplished flautist with connections to the French Royal Court and his daughter, a harpist – was a delight, and a perfect example of the singular joy that this music played on the instruments it was written for can reveal. 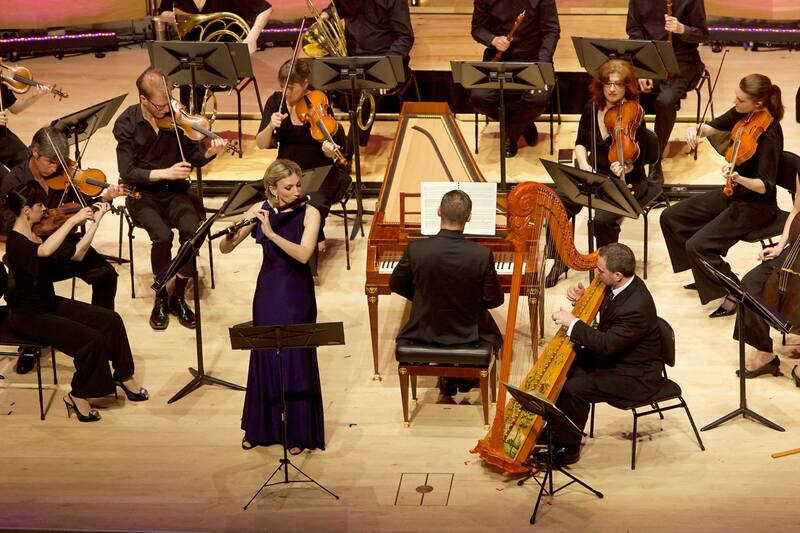 Melissa Farrow’s Baroque flute filled the Recital Centre with an airy, sweet birdsong, light-winged and luminous – its tone all round pearls, so different to its modern cousin’s diamond edge. Marshall McGuire’s harp sparkled in and around the flute and the ensemble passages, mirroring and doubling melodies and fragments of melodies brilliantly. Both Farrow and McGuire are international bright lights, as is the Brandenburg itself, yet they all play together with such abiding joy and humanity that glittering prizes and even more glittering CVs are put aside and we are in the moment – as all great music should be. The ‘Jupiter’ – Mozart’s final symphony and the last of three written in six weeks – has always been tantalising in its suggestion of what might have been. The invention, the compositional strides and innovations all point towards even greater things. And to hear it played so full-bloodedly tonight was to be just a little more in awe of Mozart, and of the Brandenburg. The thirty or more players – with Paul Dyer conducting, not playing – dug in deep on the forte sections, almost recalling the blasts and rages of Beethoven. Mozart obviously relished the power and glory of the large ensemble in his writing and Dyer channelled that joy. As with all great conductors, Paul Dyer ‘plays’ the ensemble rather than conducts, drawing out all of the quirks and subtleties in the music from the players, and not the instruments. His orchestra is people, not technicians and that is what I have always felt makes them great. The opening movement was stunning, both with the size of the Orchestra’s sound and the lively attack. The second movement – the Andante Cantabile – sang and swung lyrically and lightly. The Minuet and Trio was played with a sweet smile across its face. The final movement of Mozart’s final symphony – Allegro Molto – is where things really come alive. Alive to tour ears, alive to possibility: the possibilities of art, the possibilities of being human, which ought to be one and the same, and in the hand of true genius, are. The diversity and texture in Mozart’s writing is what you first notice. Then the invention and sense of play begins to thrill – the motifs and themes are passed around the instrument sections, even around the instruments themselves. Counterpoint is everywhere, but not as mathematics, as play – as the language of genius at play. Some distinctly unusual, almost jazz, harmonies rise and fall. Yet amidst all this lattice of invention and colour, the sense of melody and forward movement is never lost. It is dazzling and uplifting, and The ‘Jupiter’ beggars what might have been. The Australian Brandenburg Orchestra truly gives it the reading the work deserves – they are discovering and enjoying it in parallel to us, it seems. Life is what Mozart’s music bursts with, as well as a very human spirituality. The same can always be said of Paul Dyer and The Australian Brandenburg Orchestra.